I can’t find a web site dedicated to the Medieval Market this year, what I can tell you is the it runs from this Friday to Sunday. From past experience, Saturday and Sunday are the most popular days so, if you want to look around without the crowds, perhaps Friday is the best day to go. No doubt there will be all sorts of events taking place but as I say, without a programme, I can’t tell you what or when these will be. The thing I am most looking forward to is one of those roast pork sandwiches – naughty but very tasty. According to the newspaper Laverdad, the Texas Oil Company Ltd is owned by Russian capitalists and investors and has its headquarters in one of the luxury villas built by the Jesus Quesda family in Ciudad Quesada. Apart from marketing fuel, oils and lubricants for cars, they also market food and beverages; sell, service and rent all types of vehicles and run hotels and restaurants. The paper goes on to explain that Texas Oil SL are currently in the business of acquiring petrol stations in the Southern Costa Blanca region, particularly those that are showing low profits. They have just bought a station in Mutxamel and are looking at one in Los Montesinos along with further stations in the industrial area of Babel and Apollo Street in Torrevieja. These petrol stations were previously owned by Tamoil, a company linked to the family of Muammar Gaddafi. The good news for consumers is that the newly acquired Texas oil stations offer the lowest prices for fuel in the province; for example their biodiesel is priced at 1.229 Euros per litre. Just a pity that Skoda warns you not to use this fuel in their diesel engines because it can cause damage. Whilst writing this blog, I often find pictures that I want to incorporate into my stories. If they are my own photos, then I simply insert them into Windows Live Writer (the best blogging tool out there) but when the pictures are screen grabs, the process used to be a lot more tedious. When I had Vista, I used to grab the whole page and then edit it using Photoshop to crop out the unwanted parts. It was the same when I wanted to use a screen grab for my Flickr 365 project. For those who still use earlier versions of Windows, there is a better solution that comes in the form of a program called SnapIt. Read the description of what this program does and see whether it could help save you time. You can find out more about this product by clicking this link Screen Capture Software. PS If you have Windows 7 on your computer, you will already have a similar program called Snipping Tool which does much the same thing. SnapIt is really for those with older versions of Windows up to Vista. For Valentine’s Day, the Department of Commerce and Hotel in Torrevieja will be installing a giant screen in the Plaza de la Constitución. Anyone who wishes, can make a video declaring their love which will then be shown on the screen between the 10th and 14th February. Carmen Navarro Andréu Dunia "The First Christmas"
Monica Torres Belmonte "Christmas Lucia"
Rosa Maria Moya Anton "Christmas cakes"
James Van Ravenstein Grau "Santa's Dream"
Pablo Perales Andreu "It happened at Christmas"
Marina Medina Esquiva "Man of the Park"
Belén Antolín Rodriguez "The Miracle of Three Kings Day"
Evaristo Moya Moya "Cludy and the Snowman"
María Esquiva Belmonte "Migratory Birds"
Teresa Garcia Gracia "The Miracle of Christmas"
I recognise one name in particular there – Evaristo Moya Moya who got a special mention in the Adult Category. I know he reads this blog so to him I offer my congratulations. Included in the documents published by Aurelio Murcia are those related to the sale of municipal land by our house. The project was to build a hotel complex along with golf practice courses at La Predrera. As it turned out, this was deemed to be illegal and so the company concerned, Proyectos e Inversiones Patrimoniales Rambla SL, sent a document to the Ayuntamiento on the 7th April last year claiming 7,405,283.01 Euros in damages for the losses they have suffered. This is, you will recall, the subject of one of the cases against the former mayor, José Joaquín Moya Esquiva, yet to be examined by the courts. Monday at 8pm, there is a Council Meeting scheduled at the Ayuntamiento in Bigastro and so with perfect timing Aurelio Murcia has published on the town’s web site the audit report that was commissioned by the PP just after they were elected. The sorry picture of the town’s situation is there in black and white for all to see. What the new government team asked Aplem Consulting to do was to provide an accurate picture of the state of finances for the town as of the 31st May 2011. In the report, the auditors highlighted the difficulty they had in obtaining accounting data from the people responsible because normal accounting procedures had not been strictly followed. Still Aplem Consulting came up with figures which show that 7,770,888 Euros was owed to creditors – that debt is pending legal action. The financial debt was calculated at 4,924,174.30 Euros; which when interest for late payment is added on rises to 5.7 million Euros. The total of debt for Bigastro is a staggering 31 million Euros. You can find the report, along with other relevant documents by following this link. PS Now I understand why there are no budget figures on the web site for the town after 2008. I think it is fair to say that there could be some red faces at the meeting on Monday! For the benefit of those of you who like a good read, Maxine and Carol have agreed to take over running the “La Pedrera Book Club”. This club, which was started by Allan White, has quite a lot of books to choose from to suit all tastes. Sunday once a month between 3 and 4pm in the bar up at La Pedrera starting today. The main topic of conversation in Bigastro is how cold it is at the moment. If the forecasts are correct, it will get a whole lot colder towards the end of next week. One forecast shows temperatures at night plummeting to –1 on Thursday night. I’d rather go with AEMET’s forecast which says it will drop to 2 degrees on Tuesday night and then pick up slightly to 3 the days afterwards. Temperatures in the daytime will not be what we would regard as mild – 14 degrees is not good. The only crumb of comfort for us is to look at weather conditions for England which is in the middle of a cold snap. According to forecasts, temperatures will barely rise above freezing in the daytime and will drop to minus 3 or 4 at night in Manchester where our youngest daughter lives. If it is any comfort to her, things will be worse for our eldest daughter who lives in the Midlands. The forecast for Wolverhampton is for daytime temperatures of minus 4 in the daytime and minus 8 at night by the end of next week. Trying to fiddle the electricity is something that has been going on for years. I remember hearing of people in Britain who used magnets and other devices to stop the wheel in the meter from turning. I also heard of people trying to connect to the supply before the meter and even hooking up to street lights to get themselves free electricity. Where the cables are underground, it is very difficult to get yourself free electricity but of course, in many parts of Spain, the cables are still carried on poles especially in areas where there would not have been a supply before the houses were built. Making a connection to a pole is obviously a whole lot easier. I read in the papers this morning that engineers from Iberdrola, accompanied by officers from the Guardia Civil, visited houses in Orihuela, Bigastro and Benejúzar where the owners had connected up to the poles that carry overhead cables to get themselves free electricity. The houses were apparently in the poorer areas of the towns. In some cases Iberdrola suspect the fraud may well have been going on undetected for years. The neighbours knew what was happening but were afraid to report the cases for fear of reprisals. The company say that it will be very difficult to work out exactly how much electricity was consumed without payment because they have no no way to meter an illegal connection to the poles that carry the cables. The engineers from Iberdrola dismantled the connections and warned the individuals of criminal proceedings but they know it will only be a matter of days before new connections are made. They now need to find a way to prevent these people from making a connection to the overhead cables. We learnt yesterday that there is no such thing as a Spanish town, no matter how small, that doesn’t have at least one bar. The directory of companies on the Bigastro web site lists 30 bars, cafeterias and restaurants in a town of 7,000 people. The bar is the centre of social activity in the town, it is the place where Spaniards go for breakfast, for an aperitif before lunch, for tapas during the evening and at the weekends it is the place to meet up with friends. There are bars that open at 7am to serve breakfast to workers, there are those that open just in the evenings to serve tapas and drinks and yet others which are open during the daytime to serve people around lunchtime. A few are open both during the day and also at night. It isn’t all about alcohol though, visit any bar to observe the locals and you will find many of them drinking water or soft drinks. When they do drink beer, it is usually in a small glass or cana. Pint glasses are normally reserved for foreigners - notably Brits. The other thing you will notice are the families, children are just as welcome in a bar as adults but usually only during fiestas or at the weekends. Where do you go after mass on Sunday – to the bar of course! Most bars serve food in the form of snacks and sandwiches, some though will have an area where you can enjoy a cheap but cheerful menu of the day. Remember that the main meal for Spaniards is taken between 2pm and 4pm. La cena, in the evening is usually just a snack of some sort. All that is changing though in cosmopolitan areas where tourists want a main meal during the evening and just a snack at lunchtime. After closing the market at the Recinto Ferial and looking to move it to the area by Ociopia, it now seems that Orihuela’s market will located back in the Recinto Ferial. Plots for the stalls are being marked out in readiness for January 31st. There are also plans for Orihuela to hold a Saturday market in the city centre. This would only have 150 stalls so it will not compete with the regular Tuesday market which has 295 stalls. I read this morning in the Costa Blanca News about a scheme that Carrefour are running to help pensioners during the economic crisis. The hypermarket chain are offering over 65s a card which they call Plan 65+ which you can apply for in store. The paper does not explain just how you apply or what documents you will need to prove you are a pensioner. Using the new card at the check out will apparently take off the tax (IVA) from all fresh products. The reduction applies to meat, fish, bread, pastries, fruit and vegetables, cheeses and eggs. The standard rate of IVA in Spain is 18%, 8% for most foods and 4% for essential items like bread, milk, eggs, fruit, vegetables, cereals and cheeses. Apparently the card can be used for online purchases as well as those made in store and can also be used by someone who is doing the shopping on your behalf. You know the tax saved may not be much per item but every little helps. Having got myself a flash brolly kit, I needed to work out how to use it. The first thing I had to do was to make sure that the flash filled the brolly (not much point having a large brolly and only using part of it). That meant using the zoom facility on my flashgun to set the widest angle (smallest number) possible. Since the flashgun was off the camera, I had to set the exposure manually. Flash on my reflex camera will only work properly if the shutter speed is set at 1/200th of a second or slower so I set it to about 1/150th. Since the duration of the flash is much less than that, the speed set will not affect exposure. The exposre will be determined in this case by setting the aperture and the film speed (ISO). Apart from controlling exposure, I use the aperture to control depth of field so I will want to set that accordingly. A smaller aperture (higher number) gives greater depth of field i.e. more of the subject will be in focus and a larger aperture (smaller number) will give less. Sometimes I want more and sometimes less. So I set the aperture first. That leaves the film speed as the means to control exposure. A lower ISO number will give less exposure and a higher number more. I could calculate the correct ISO number to use by using the guide number of the flashgun and the distance of the flashgun from the subject but to be honest, with a digital camera it is just as easy to use trial and error and examine the results on the screen at the back of the camera. Start with a rough estimate and then fine tune it is the way to go. Ah but surely, having to use a high ISO will create a lot of horrible digital noise. That is true, anything less than about 1600 ISO is going to be OK on my camera. However, in those cases where I am going to use a small aperture which will mean setting a high ISO to compensate there is another trick I can employ. My flashgun can be set to different power levels ranging from full power to 1/128th power so, when I use a large aperture I can still use a low ISO speed by turning the power down. You know this all sounds a lot more complicated than it actually is in practice. As I said, it is all a matter of trial and error. Step 3 Using the brolly as a reflector or as a diffuser. Cost 2 Euros to cover the expenses of the Recital. Let me explain; my late mother-in-law used to describe certain forms of classical music as “arsey”. To her ear, music by e.g Shostakovich was like, “rubbing your arse (backside) with a brick”. It was a colourful expression which summed up beautifully the pain she felt when listening to certain contemporary composers. I feel sure that Ars Musicanbum will not inflict the same sort of pain! For those who want to learn how to control pests and diseases that affect citrus trees, Bigastro is organising a 12 hour course. The course for 25 students will be run by professionals from the Valencian Institute of Agricultural Research and will take place between the 23rd and 26th April in the Municipal Auditorium Francisco Grau - 7pm until 10 o’clock. I would like to know why my lemon trees have yellow leaves in winter and why they only produce a small crop of fruit. However with only two trees and with insufficient Spanish to understand all that is being said, I’ll probably have to look elsewhere for an answer. Actually, a friend of mine did point me in the right direction last year. He noticed that my trees were surrounded by limestone chippings and explained that lemon trees are not lime tolerant. His solution was to remove the chippings and to feed the trees with some acidic material. He suggested collecting vegetable waste and old tea bags, let them rot well down and then spread the mix around the base of the trees. A further suggestion was to add sulphur to the soil because that will loosen it and reduce the ph level. Yesterday, a group of parents, students and teachers from IES Miguel Hernandez and the Colegio San José de Calasanz protested outside the Town Hall in Bigastro. The headteacher at IES Miguel Hernandez, Paul Perales, said that the protest was about the cuts in spending by the council. He explained that his school has not received any money since May and that meant he could not even plug a heater in because there was no money for the diesel which runs the generator and added that his school is short of vital supplies like copier paper, chalk and even toilet paper. Inevitably, companies are reluctant to keep supplies to the schools without payment of arrears. The headteacher at San José de Calasanz, Solomon Rivera, painted a similar picture at his school. In his view, the two vital services in any town are health and education and these should not be affected by cuts in local council spending. The cuts, he says will lead to a decline in the quality of education provided. Like a lot of photographers, I prefer to use available light when I can. However, there are times when the available light is either insufficient or is in the wrong direction for the effect you want to create; that is when you need a flashgun to provide light. Many cameras have built in flash which you can use on these occasions but of course these have their limitations. The first is the power which is usually quite low meaning that they will only work within a relatively short distance. The second is the position, which is by definition close to the lens. Apart from the red eye effect this creates, this means the light produced is harsh, flat and unforgiving. My compact camera has built in flash and no alternative so when I need extra light, I have to put up with the unnatural effect it produces. The obvious solution, with a camera which has a hot shoe or flash socket, is to buy an external flashgun which will have a lot more power. Mounting it on the top of the camera though still gives that unforgiving light and at the same time creates ugly black shadows especially if you use your camera in the vertical position. In a sense, moving the flash a little further way is worse than having it close. To soften the effect you need to make the flash appear to be larger which you can do with various clip on attachments. The simplest and cheapest of these is the Stofen which is made from translucent plastic. Pop it over the flash and point the flashgun head upwards at about 45 degrees and bingo, the light is a lot softer and the shadows a lot less harsh. I use one of these a lot when I am out and about. Even better though is to move the flashgun off the camera. Of course you then need a way to communicate between the flash and the camera. This can be in the form of an extension cord which fires the gun and transmits the data at the same time. You also need long arms, an assistant or a light stand/tripod to mount the flashgun on. If your camera is heavy like mine, holding it with one hand and a flashgun with the other is a no no. Taking this all a step further, you can eliminate the trailing wire by using wireless flash triggers. The market leaders in this field are Pocket Wizards but these cost a fortune to buy. Fortunately, there are cheaper alternatives which may not be as durable but do the job equally well. The downside of most wireless triggers is that the flashgun no longer works in automatic mode meaning that you have to set the exposure manually. This is what we used to do anyway before TTL and then ETTL flash became the norm so it is no big deal. In any case, with digital cameras it is a lot easier than it was with film because at least with digital you see the results immediately and can make adjustments as necessary. So, now that you have the flash off the camera, it is time to consider other forms of light modifiers. The cheapest and simplest to set up is a brolly. Just like the kind of brolly you use in the rain but this time made of white, silver or gold material, these are used as a reflector to give a broader spread of light. You can also use a white translucent brolly the other way round i.e. you shoot the light through it to give an even softer, broader effect. Those professionals who have expensive soft boxes and beauty dishes may scorn them but the truth is the flash brolly is a very versatile tool. That is where I am up to now, experimenting with ways to improve my flash pictures and capture better portraits of my granddaughter Molly. My next step is to consider a second flashgun either to be placed behind the subject to give a rim light or on the opposite side to the main light for cross light effects. That is very much for the future though, I need to master using one light and a reflector first! For those who are interested, the Strobist blog explains all this a lot better than I do. This picture taken from the Daily Telegraph shows the Northern Lights as seen by specialist photographer Reed Ingram Weir from the A1 near Anick, Northumberland. The aurora borealis normally appear above Iceland and Norway but were seen further south this weekend due to unusual solar activity. “The sun is in the middle of an active phase of its 11-year solar weather cycle and is therefore becoming more unstable. A powerful flare erupted from the sun last Thursday, unleashing a plasma wave that supercharged the Northern Lights into high latitudes. Auroras occur when charged particles from the sun interact with Earth's upper atmosphere, releasing visible light in the process. Apparently, it is possible that the phenomena will be visible throughout Britain by the end of the week. I do hope my friend Pete and his wife Laura are able to capture a picture or two in Liverpool for their Project 365s. The good news is that 9,290 houses were sold last year bringing 65 million Euros of revenue to regional and national government by way of taxes. The bad news is that only 500 new houses were sold. Most of the sales were in Orihuela and Torrevieja. In fact these two, along with Guardamar, Pilar de la Horadada and Rojales, accounted for 81% of the sales with a further 510 houses selling in Ciudad Quesada. It is in therefore in the coastal strip and tourist areas where the sales were generated presumably by people mopping up on low prices to obtain a holiday home. So, whilst these figure are not encouraging for the construction industry, they do show an improvement over the situation of the last two years. I have received an email from Maria José López Robles, the Councillor for Third Age in Bigastro, telling me that she will be bringing copies of a questionnaire to Villas Andrea for us to complete. The idea is that we provide the information required to allow the council to give us the services we deserve. Maria José would like many returns as possible so that she can form a complete picture of our needs. PS Knowing that the council in Bigastro faces a huge black hole in its finances, we may need to be creative and circumspect with our responses. 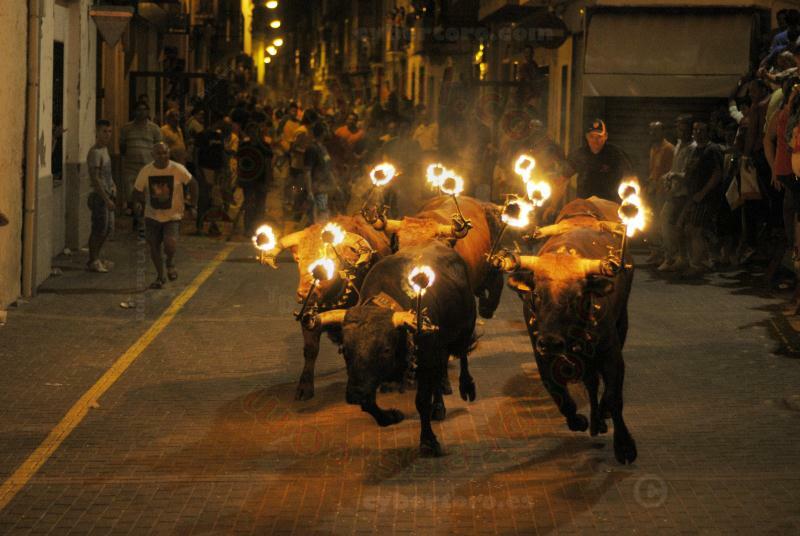 In the east and north east of Spain, towns celebrate their fiestas with "toros embolados," or "flaming bulls,". Basically, large balls of flaming wax or fireworks are attached to the bulls horns and then they are set loose to rampage around the streets. Although the crowds at these events taunt the animals, in the end the bulls' lives are spared. Such a festival took place in the small town of Navajas on Saturday but it all went horribly wrong when a 45 year old man tripped just as the bull was released. The bull gored him and then trampled on his head causing irreversible injuries. The mayor of the town offered condolences to the family and arranged for black bows to be tied to the town hall flags. What he did not do was cancel the similar event scheduled for Sunday. Why would he? If you choose to chase angry bulls in narrow streets, then you have to know that there is a risk involved. The man in question had travelled 70km to the event, it wasn’t like he was an innocent bystander who just got caught up in what was going on. Some would say he was brave, I would just say he was stupid but that is just my opinion. The airline Vueling will be operating three daily flights to Paris Orly airport between June and September. They are also offering new flights to Cardiff, Palma de Mallorca, Amsterdam, Barcelona and Ibiza. At the moment, Vueling have a promotion going on with tickets selling from 19.99 Euros each way for flights between 23rd January and 28th March. The tickets, which are on sale until next Tuesday, include destinations such as Marrakech, Moscow, Nantes, Naples, Amsterdam, Paris, Venice, Lisbon, Malaga, Sevilla and Tenerife (some with connections via Barcelona). You can buy tickets for Vueling from travel agencies, by calling Customer Services (807 200 100) or online at www.vueling.com. For iPhone and Android users the portal is m.vueling.com. Because the school I taught in had a no smoking policy, I had to go out onto the pavement to have a puff on my pipe. I was out there one afternoon with a colleague enjoying a pipe of my favourite tobacco when three youths on bikes came along the pavement. As they passed us, one of the cheeky beggars snatched the pipe from my mouth. Within seconds the hooded thieves were gone leaving my colleague and I standing in disbelief. All we could do was watch them disappear down the road. Figuring that they had just stolen the pipe for a laugh, we followed their tracks in the hope that they may have simply tossed it away but we never did find it. Unbeknown to the thieves, that was a hand made pipe worth quite a lot of money – I don’t go in for cheap machine made jobs that smoke harsh and bitter. In any case, pipes are like cherished friends – each with its own characteristics – they give a lifetime of pleasure to the smoker. None of my current pipes are less that twenty years old and each has got better as the years have progressed except of course that one! Moving on many years from that sorry incident, people in the streets of London and for all I know other cities as well are suffering the same problem that I did but this time it is mobile phones that are being stolen. In particular it is smart phones that cost several hundred pounds that the thieves on bikes are targeting. The modus operandi is the same though; the thieves spot a victim and then ride past snatching the phone as they go. The phones are quickly switched off and the SIM cards are removed preventing services like “track my iPhone” from working. Eventually, the phones are shipped to countries where the phone barring service won’t block the operation of these handsets. The price of a stolen iPhone in India is high so that is where many end up. It may look cool and impress people to walk along the street with your iPhone pressed to your ear but it is risky. Far better to use one of those geeky handsfree cables and keep the phone in your pocket. You may look as if you are talking to yourself but at least your phone will be in a safe place. Alternatively, get yourself a ten quid Tesco phone like Pam did – no self respecting thief would dream of snatching one of those. As for using a flashy 3G iPad in the street, well that would simply be asking for trouble. Lemon growers in the Vega Baja are having a hard time of it. They are having to compete with crops from Morocco and Algeria where labour is much cheaper and from Turkey where the growers receive financial support which allows them to sell their crops at below the cost of production. At six cents per kilo, the current market price, farmers in Alicante province are loosing money. Their only hope is that there is a frost in those other countries because that always pushes prices up or that there is a frost here in Alicante because then the local growers can claim on their insurance. In the meantime some farmers are allowing people to pick the crop for nothing as long as they leave the trees clean – at least then they don’t have to pay pickers to collect the fruit. Tickets for the 2012 Olympics are hard to come by in Britain. If you find any on the Internet then it is likely that you will pay well over the odds for them. However, here in Spain, things are different because the Spanish Olympic Committee decided to sell its allocation of tickets through 20 Fnac music and book stores. Even though they have been on sale since December, very few have sold and so tickets for premium events are still available. I suppose the nearest Fnac shop to here is in Barcelona. Unless you are young, Spanish and female it is possible that you have never heard of him. David Brisbal is a Grammy winning pop star from Almeria. He first appeared as runner up in a reality TV show called Opercion Triunfo. Since then he has released four albums, toured Europe and Latin America and has sold more than 5 million records gaining 30 platinum albums, 15 gold and two diamond. Brisbal will be performing in Torrevieja on Saturday, 25th February but don’t expect to get a ticket because the 1,100 available for the show at the International Music Auditorium were sold out within an hour of release. As luck would have it, the town hall in Torrevieja have managed to persuade BrIsbal to perform on Friday the 24th as well so that more of his local fans can see their star. At yesterday afternoon’s Spanish class, our new teacher clearly knew exactly who I was without me telling him. He explained how I was well known for taking photographs for the town which were well liked by bigastrense. He went on to say that my contribution to local affairs was much appreciated. Those were very kind words which made me blush! Down at the market yesterday, Pam and I were talking with some of our neighbours. Our discussion centred around what we found attractive about Bigastro and we came to the conclusion that it was the people. We all agreed that we have never lived anywhere before where we were made to feel so welcome and where people, who you hardly knew, went out of their way to help you. In the end, it is not smart buildings and beautifully manicured parks that count, it is the welcome you feel that is most important in the place you choose to live. You might have guessed that the party who are now in opposition in Orihuela would come back with their own spin on the accusation that the Medieval Fair last year cost the city 300,000 Euros – a figure which they deny is true. They go on to accuse the present government team of having already chosen a company to organise this year’s fair in spite of the fact that there are five days left for tenders to be submitted. They say that the proof of this lies in three web sites which lead to the same company “Fusion Medieval” who are inviting merchants to apply for stalls. The PP also say that it is nonsense to say that the market this year will be held at no cost to the city, pointing out that there are bound to be expenses for water, electricity and security services. Although all politicians will deny this, it seems almost to be a prerequisite for the job to be colourful with the truth. In 2005, the ex-mayor of Bigastro, José Joaquín Moya approved the plan for Sector D6 which included a plot of 1,170 square metres designated as parkland. A year later, Moya signed an agreement with Repsol Butano which allowed them to install two gas tanks holding 46,500 litres of propane on the same land. Moya went ahead with the order and the tanks were installed in October 2007 in spite of the fact that he knew that the work was not covered by a licence. Also implicated are the council technician and the secretary who also signed the paperwork. The case against José Joaquín Moya has been examined in the District Court No 3 in Orihuela. The judge has now concluded that the case should be tried before the High Court and has set bail at 75,000 Euros to cover the costs of demolition should the defendants be found guilty. The anti corruption prosecutor has asked for two terms of prison of one year and ten months and four years for the alleged crimes. Still to come are two further cases against the ex-mayor; one for accepting the gift of a Volkswagen Toureg which was allegedly paid for out of public money and the irregular auction of protected land at La Pedrera to allow the building of a residential complex and a golf practice course. The Medieval Market in Orihuela cost the city council 300,000 Euros last year; 150,000 was paid to the company that organised the market and a further 150,000 was spent on the various shows that took place during the three day event. This year the council say that the market will be run at no cost to the city and in fact they expect revenue from the company to cover labour costs incurred by them. They also say that the Moors and Christian groups taking part will not have to pay for their stands. That decision leaves the cost of staging the market in the hands of the organisers who will either have to pass that on to stall holders or charge for entrance to the market. Apart from the stalls selling food and drink who no doubt will see a good return for their money, I imagine this may well hit those selling specialised products who probably earn very little. The market has become a very popular event that attracts a lot of tourists to the city. Each year it has grown in size and popularity. Let us hope that the lack of money on the part of the council does not adversely affect this trend. My Flickr picture for Tuesday was the toasted almonds that Ana and Marisu brought us as a gift for taking photos of their children. As I explained, the almond is an important local crop here in the Vega Baja. Before the transfers of water from the Tajo to the Segura it would have been the principal crop because the almond tree only requires rainwater to survive. The citrus trees that took over require irrigation and of course the fields of broccoli and artichokes need regular watering. The biggest nail in the coffin for almond growing though was cheap imports of Californian almonds. In this area you find most of the almond trees in San Miguel de Salinas, Pilar de la Horadada and to a greater extent in Orihuela on the northern slopes of the Sierra Escalona, ​​port Rebate, Torremendo, near the dam of La Pedrera and the valleys between the mountains of Pujálvarez and the Cristo on the border with Murcia. You can also find almond trees in Benferri, La Murada and on the path of the Albatera a los Hondones. They are easy to spot at this time of year because the bare trees of winter are becoming loaded with white and pink blossom as the warm weather of Spring arrives. In fact you may find that the trees are flowering early this year brought on by the unusually warm weather of the last few weeks. Let us hope that we don’t experience the same cold snap we did last year because that badly affected the artichokes which were blackened by the frost. Broccoli is hardier and those survived. The citrus trees were slowed down but ultimately came into flower a little later. If you visit Google today or Wikipedia, you’ll find messages that warn about the dangers of two bills that are going thought the US Senate. Many other sites on the internet will be blacked out for the day. The bills aim to curb online piracy but say many, they will also severely restrict freedom of expression on the web. As you might expect, the bills have received broad support from the entertainment industry who loose millions to online piracy every year. However opponents of the bills say that they will restrict freedom of expression and increase the risks to cyber security. The controversial clause contained in the bills requires internet service providers in the US to block access to foreign sites that infringe copyright. Giving ISPs these sort of powers would allow them to censor the internet and that would be bad. After the problems we had with the first teacher that Aurelio found for our Spanish class, we thought that was it – no more lessons. We hadn’t counted on the resourcefulness of the councillor for education though because he has found another ex-teacher who just happens to have the same name as the first. Pam and I missed the first meeting with the new teacher because we were in England at the time. Apparently, he pitched the lesson too high for the students in the class and so vowed to prepare something more suitable for this week. Yesterday was our first lesson. The new teacher came well prepared with suitable material; he had plenty of exercises for us to complete which involved listening carefully to his instructions. Listening skills are possibly the hardest to achieve so this was the kind of excellent practice we needed. So now we can look forward to lessons again knowing that our Spanish will continue to improve. A big thank you goes to Aurelio Murcia for finding us such a good teacher and of course to Antonio for volunteering to work with us. Once you have sold a house and moved away, it isn’t always a good idea to go back and see what the new owners have done. In the case of our old house in England we have no choice because we regularly visit our friends who live opposite. In fact, most of what the new owners have done have been improvements we would have made ourselves if we had continued to live there. Our ex neighbours here in Spain may not feel the same about their old house if they ever return. The new neighbours are not keen gardeners so most of the plants have gone including those in the front garden and those on the fence between the properties. The railings at the front have all gone and the wall has been built up to about 3m high. It is the same for the wall the other side which is also 3m high. We are going to have the wire netting removed between the two houses to be replaced with the same fence panelling that we have on three sides. Then there are plans to build a barbecue area in the corner at the front left corner and of course there is some remodelling going on inside the house. At some time in the future they plan to build a pool but have not yet decided where exactly that will be. I’m not sure what their plans are for the small pool at the front but certainly the waterfall has gone as have the stones that laid out the garden. As I said, the old neighbours may not like what has been done. It is perhaps best if they don’t see the house now, after all they did spend a lot of money on the work that has now been demolished. Where does Britain get them from? It is almost a tradition that teachers (and ex teachers) do not see eye to eye with Parliamentary Education Secretaries in Britain. The latest one is Michael Gove who has thrown fuel on the fire by recently suggesting that teachers should work longer hours and should put up with having parents in the classroom observing how well their children are being taught. He says that because teachers enjoy their work so much, they would not mind being at school for longer. Clearly the man is at best misguided and more probably barking mad! Not wanting to confine his lunacy to thoughts about teaching and education, Mr Gove now says that the British public should donate a new royal yacht to the Queen as a mark of respect during the jubilee year. He reckons that large scale celebrations are just what the country needs during this period of austerity. However, accepting that finding public funds might prove difficult, he suggests that private donations should be sought to help foot the bill. Apart from the cost, which was estimated at 60 million pounds in 1997, does Gove really believe that the Queen, who is pushing 86, would like a new yacht to play with? If the Queen wants a yacht, then I would suggest one made by the Star company in Birkenhead. The previous royal yacht Britannia was decommissioned in December 1997 and is now a visitor attraction in Edinburgh. Alicante is one of seven provinces on orange alert for heavy snow today. The others are; Jaén, Granada, Almeria, Murcia, Valencia and Castellón. The coast of Galicia and Asturias is on yellow alert for coastal phenomena. In a statement by the Interior Ministry's department they ask citizens to avoid travelling by car in the most affected areas which are expected to be the central and southeast quadrant of the peninsula and on access roads to large cities where there may be delays. If you must travel by road, then be alert to the possibility of ice, keep an eye on information about the weather situation and road conditions, check your vehicle before starting out, follow the recommendations of Trafico, fill your tank with fuel and carry chains. Civil Protection also advise people to take warm clothing and a mobile phone with spare battery and or car charger. As reported by the State Meteorological Agency (AEMET); the snow is affecting mostly the centre and the southeast of the peninsula, especially the Valencian Community, Castilla-La Mancha, Murcia, Madrid, the area of ​​the mountains, and Andalusia, where the heaviest snow is expected in Almeria, Jaen and Granada. I know this sounds like sour grapes but Pamela and I do not receive the winter fuel allowance. However, we still face hefty bills for gas during the winter months like everyone else. During the boom years, Spain embarked on many adventurous projects that they believed would enhance the economy. One such project was the building of new airports to serve the tourist trade. In spite of the fact that there was already an airport at Valencia, another at Barcelona and one at Alicante, they went ahead and built yet another one at Castellón at a cost of 150 million Euros. Possibly because of political differences between the then Socialist government and the Conservative run region, the airport was not granted a licence. However, gaining a licence was not the only problem for Castellón because the low cost airlines showed no interest in it. As a result the airport, which was inaugurated last March, has never had an aircraft land on its runway, there are weeds growing in the tarmac and the car park stands as empty as the day it was built. According to El Pais, 30 million Euros was spent on advertising the new airport at tourist fairs and more recently a 25 metre high sculpture costing 300,000 Euros has been erected in front of the terminal building. They even spent 2.35 million Euros sponsoring Villareal CF to wear the airports logo on their shirts for three seasons. The problem with computers is that we mostly all have one but don’t know sufficient about them to avoid the pitfalls they bring to us. I regularly get emails from well meaning neighbours warning me of a virus that apparently neither Microsoft nor Norton know how to cure. In every case so far, the virus has turned out to be a hoax. I also receive emails telling me that my online banking with a bank I have never used will shut down if I don’t reactivate it and of course I get emails from Nigerian gentlemen who want to give me a fortune for helping them release a trust fund for them. The latest wheeze is to access people’s Hotmail accounts and send out emails from them to the whole address book. Ha, ha that is a fun thing to do isn’t it? The latest scam to hit Orihuela Costa takes things even further. Apparently you get a phone call from a number with a UK prefix, the caller speaks in English and tells you that your computer is sending a huge number of emails that are collapsing the system. The kind person offers to solve the problem for you by taking remote control of your computer and then guides you through the process of giving them that access. What the caller actually does is install malware which both infects your system and at the same time gives them access to all the personal details including bank numbers via a keylog tracker or by looking at your cookies.To add insult to injury, they charge you 350 Euros for doing this! There are legitimate times when you would want to give someone remote access to your computer for example if you had a software fault and called the manufacturer's helpline. As soon as the fault was rectified you would close the access down (it is closed by default of course). Like with opening .exe files from people we don’t know, we now understand that we should never allow remote access to our computers for people just over the phone. One of the things that I neglected to tell Pam before we moved here was that this is a region of regular seismic activity. In the last year alone there were 12 shocks in this area that could be felt at some place or other. The one at 6:07 yesterday morning was a mere 1.7 quake with an epicentre out to sea. It would have been likely felt by those living in Torrevieja, Orihuela Costa and Pilar de la Horadada. The new delegate of the Consell in Alicante province, Juan de Dios Navarro, yesterday gave a major boost to help Bigastro’s out of its unsustainable financial situation. Madrid will now pay the money it withheld to Bigastro which will enable to town to make it short term payments. In addition, Sr Navarro will help Bigastro finally legalise Sector D-6 bringing great relief to the people living there. Not Pam and I, we have no intention of moving house for the foreseeable future. We are talking here about Laura and Dave who would now like more living space. Whilst buying your first house might seem difficult, moving up the ladder is a whole different game. Apart from finding the house you want, there is the added problem of selling your existing home. I can't imagine that will be difficult but with the present state of the market it is hard to say. Once you have bought your first house, you do have a clearer idea of what you want for a second property and thus become perhaps a little more picky. Laura and Dave know exactly what their needs are and thus what features to look for in their second home. Location is top of the list for Laura and Dave. They need an easy commute to work, be within reach of facilities like doctors, shops etc and of course the network of friends they have built up. Although that narrows the search somewhat, it does mean that they should be happy with their new location. Then of course there is the question of size. Ideally they would like two separate reception rooms, definitely they want three bedrooms and a garden for Molly to play in. From there, the permutations are endless and the have an open mind about some of the options available. Laura and Dave have viewed a fair number of properties and found one early on which ticked all the boxes. Unfortunately, that is now under offer and so they need to look elsewhere. That is where it has become tricky because they inevitably compare what they see now to the one they liked in the first place. Like with all house purchases, there will be probably be compromises to be made. Just where those will be is up to Laura and Dave. Pam and I can only offer our advice, in the end the decision is there's to make. Sunday the 15th January marks the Fiesta of San Anton, the day when you can take your animals to the Plaza de la Constitucion at 1pm to be blessed. Although, as you might expect, there will be lots of dogs and cats, there could also be some unusual pet animals as well. There will also an opportunity to win yourself a pig in a raffle. Before you get carried away with the idea of a pig as a pet, let me remind you that these things grow to a fair old size and produce a lot of waste! Usually neighbors remain just that. As good as they might be, they rarelybecome friends. That has not been the case with Hugh and Angela. As time passed by we became more involved in each other's lives. Our children grew up together and are also good friends. There was a time when Hugh and Angela considered moving house but thankfully they didn't. When, eventually, Pam and I did move to Spain following our retirement from teaching, we still remained the best of friends. They regularly visit us in Spain and we try to make time on our visits to England to call in on them. This trip, Hugh, Angela and their son Andrew came to the funeral of Pam's father just as they did to the funeral of Pam's mother. Their presence was a great comfort to Pam and I and we thank them for that. Yesterday, we were invited over to spend time with them and stay for a dinner prepared specially for us by their youngest son Andrew. At the same time we were able to check out their newly refurbished kitchen and utility room. The process must have caused major disruption to their lives but you have to say the end result was worth every penny spent and the problems caused. There are no adjectives sufficient to explain how superb the house now looks. Now we move on to the meal that Andrew prepared. The main course was paella, a brave dish to produce for visitors from Spain. However, the result would have easily graced the best restaurant in Valencia, the home of authentic paella. Following, was a superb dessert which was an exciting twist on cheesecake without the cheese and with a ginger cake base. They say that you know who your true friends are when it comes to time of adversity. At the funeral on Friday we had the support of close friends like Hugh, Angela and Andrew – more about them later. For now I want to tell you about Glenys and Peter. Pamela and Glenys have been friends since they were 11 years old. In comparison, I have known Glenys for a mere 45 years and we have known Peter for about 40. It is true to say that Glenys and Pam are more like sisters than friends. There is very little that has happened in our lives that we hasn't been shared with Glenys and Peter. It was therefore natural, when Pamela's father died, that Glenys and Peter wanted to be at the funeral even though it meant a 14 hour round trip in the car and a few nights stay in a Premier Lodge. As Glenys remarked, Arthur was the last of our parents to pass away. His passing therefore marked the end of an era for all of us. Glenys and Peter also knew that it was important to be there to support us. It is very hard to put into words how much we appreciated Peter and Glenys being there for us at this trying time. Actually it was unnecessary to tell them because of the empathy that exists between us. This tribute is therefore not being expressed for their benefit but rather to tell others we have support that means so much to us. There is no such thing as a good funeral but as they go, the one yesterday for Pamela's father went well. The funeral director provided an excellent service, discreet and dignified. The Chaplain from the care home delivered a fitting eulogy which summoned up the man that Arthur was. In fact the way she conducted the whole ceremony was exemplary. On the way to the crematorium, as the hearse drove slowly through the village, it was both unusual and rewarding to see that a pedestrian en route removed his cap whilst the cortege passed by. Such traditional values of respect are sadly lacking these days. We were pleasantly surprised by the number of people who took the trouble to attend the funeral, which we took as a clear sign that Arthur was a popular and well respected member of the community. Now, Pam and I face the reality that we are the oldest generation of our family and as such the weight of responsibility lies on our shoulders. After a lovely day on Tuesday for my birthday, Wednesday did not go as smoothly as we would have liked. We arrived at Alicante airport in good time which was just as well because we queued for nearly an hour to check in. The only reward for that long wait was that we were given extra legroom seats at no extra charge. The flight was fine, longer than scheduled because we were flying into a headwind and touchdown in Manchester was smooth especially considering the windy conditions. Normally we hit lucky on the luggage carousel but not this time. One case came through pretty quickly but the other was the last on the belt. Still, we had our luggage safe and sound. We'd arranged to hire a car from a company called Enterprise who have offices at both Manchester T1 and T2. The office at T2, where we landed closes at 5pm and so you are directed to the office at T1. What I neglected to tell Pamela was how far on the overhead walkway it was between the two terminals. After dragging our cases for nearly half an hour we arrived at the Enterprise office which is on the very top floor of the car park only to be told that if we'd phoned them from the T2 office, they would have picked us up. Pamela nearly hit the bloke when he told us that. Then we were shown to the car which just happened to be as far away from the office as possible. After our marathon walk across Manchester Airport, that was all we needed, a further ten minutes trek with our cases facing into a howling gale. Just to aggravate matters worse, our cases would not fit into the boot so I had to manhandle a heavy case through the front door of an Opel Corsa to get it onto the back seat. Pam and I will be flying to England to attend the funeral of Pam’s father who sadly passed away just before Christmas. Originally, the date offered was today but I really did not want to attend such an occasion on my birthday so it will take place on Friday. The forecast for the rest of the week shows the storm force winds abating so our landing at Manchester should be reasonable. We really don’t like the British weather at this time of year! Those of you who follow my Project 365 on Flickr will have seen this picture yesterday announcing my 65th birthday today. I hope that at least some of you are thinking, “he doesn’t look 65” but I have to tell you there are days when I definitely feel it! Apart from raised blood pressure brought about by a sedentary lifestyle and smoking, I get pain in my left leg which a doctor once told me was caused by a trapped nerve, my left heel is almost constantly sore, I get a dull ache sometimes in my right hip, the occasional bout of back pain, my right knee suffered when I fell down a step in the Auditorium and I now have a set of dentures to replace my front upper teeth. All in all, not a lot to complain about really, there are many in a worse state than me. I’m told that if I can get through the next five years without anything major happening to me, then I should be in for a good innings. I have my fingers crossed. Although I love my retirement and living here in Bigastro, if you were to ask me which were the best years of my life so far I would have to say when I was in my thirties. That was a age when I had just enough responsibility in my job to pay the bills but not so much that it ate into my leisure time. The children were just growing up and were fascinating to be with and life seemed good. If you are not at all interested in computers then stop reading here! Otherwise you can read on and find out about my latest toy. When I upgraded my desktop computer to one with Windows 7 and the latest Sandy Bridge processor, my netbook started to frustrate me. With its Atom processor and Windows XP it just felt so slow. Accomplishing simple tasks seemed to take forever and of course some applications wouln’t run under the native resolution of the 10.1 inch screen. It was time for a change but what to buy? Another netbook would have been the cheapest option but then that would have brought no improvement so I started to look at notebooks instead. I certainly did not need a desktop replacement with a 15inch or even 17inch screen, something around the 11inch to 13inch screen size would fit the bill just nicely. The logical choice would have been a Windows 7 machine because then I could have then utilised all of the programs from my desktop on it. I therefore looked at offerings from all the reputable manufacturers including Dell, Samsung, Acer, HP and Sony. There were one or two models that caught my eye including those with a similar processor to my desktop. Then I started to look at what Apple had to offer. When I bought my new desktop I was sorely tempted to buy an iMac. I love the form factor of that machine and the fact that it runs silently. I also like the Mac OS system which I’ve used on my son in laws iMac. Having owned four desktop Macs and two Mac laptops, I’d already enjoyed a long acquaintance with Mac OS going back to System 7. The only reasons I changed over to Windows were because in comparison, Macs became so expensive and I had ready access to Windows software at that time. Macs, of similar specification, are now at about the same price as their Windows counterparts so it seemed a good time to consider a Mac notebook. To make the deal even sweeter Apple were offering worthwhile discounts on “Black Friday”, the 25th November. There were two choices; the ultra thin and light MacBook Air and the more powerful MacBook Pro; both have sleek aluminium cases and look just fantastic switched on or off. I went for the MacBook Pro with its faster processor, larger hard drive, increased memory and 2inch larger screen. If you haven’t seen one of these in the flesh, pop into Carrefour or an Apple store nearby and you will experience the same lust as i did on my first encounter. Macs are just gorgeous machines full stop. Compare them with other machines in the shop to see what I mean – sleek aluminium versus cheap shiny plastic – no contest! So what do I think of my new machine? The system starts up really quickly (instantly if I just close the lid and put it to sleep) and the machine feels very nimble, maybe not as nimble as my desktop but then that has the next processor up and twice the RAM to play with. The screen is just incredible, perhaps not quite as sharp as the Dell IPS screen I use with my desktop. The operating system is a joy to behold and the iLife software which came with it is very comprehensive and well featured. Not having access to all the inner workings of the system and not getting those indecipherable error messages is a real boon. I doubt that I will have to spend the same amount of time tuning and repairing Mac OS X as I do with Windows 7. The bottom line is that I would not be without my desktop for those times when I have a lot of photos to process or a video to put together but for everything else the MacBook is just perfect. Apart from anything else, it is more sociable to sit in the lounge with my wife that lock myself away in the spare room. Mrs W. sits on one sofa with her iPad and I on the other with my MacBook. Every now and then we can send each other messages – how sad is that! Every new year brings renewed hope for something better than before. Amidst all the doom and gloom of the economic crisis, the possibility of a breakup of the Eurozone and the Pope’s criticism about moral relativism (whatever that means) we must try to find a tiny glimmer, a minute spark which could point to 2012 being a better year for us all and for the world. I must admit it is difficult to find any indications in the news that 2012 might bring improvements. I remember at the time of the Millennium, apart from all the hubris about the bug that would cause IT systems to crash, there was a lot of optimism about the future. Sadly, that all seems to have evaporated now, gone up in smoke like the New Year fireworks that heralded the new century in. On a personal note. this year will bring a lot of joy and happiness to our family. First of all, I will get my state pension sometime after my 65th birthday on the 3rd January. That should help to offset the decline in our income caused by the exchange rate. Then in June, my youngest daughter Laura will be married to the love of her life. I’m sure there will be many other occasions throughout the year to bring us further happiness. My sincere wish is that 2012 will bring similar highlights to all of the readers of this blog and in that spirit of hope, I wish you all a Very Happy New Year. Britain was not going to be outdone again. These pictures, taken from the Daily Mail, show the amazing firework display that London put on to mark the New Year. 2012 is Olympic year for the capital so Boris Johnston was prepared to make a show of it with a display that lasted 15 minutes. Well done London!